Adelaide poets are creating a little magic in the city this month with invisible pavement poems that can be seen only when it rains. It's raining poetry: The stencil for 'Wet Leaves', by Ben Adams, on North Terrace. University of Adelaide PhD students Camille Roulière and Marianne Braux introduced the Raining Poetry initiative to Adelaide last year after being inspired by a similar project in the US city of Boston. It proved so popular that this year’s organisers received more than 120 poetry submissions, from which 29 poems were chosen. They have been painted on CBD streets using stencils and super-hydrophobic paint; the paint works by repelling water, so the stencilled words remain invisible until it rains. Poet Em König, who is doing a PhD in creative writing at the University of Adelaide and is part of the Raining Poetry organising committee, says this week’s launch of the 2018 project at the Wheatsheaf Hotel was packed. “It’s incredible – I’ve never seen a poetry launch like it. “The response from poets and the general public alike has been so warm and wonderful. You tell people about the project who aren’t even interested in poetry and their eyes light up. Most of the poems can be found on the north side of North Terrace, between King William Street and Kintore Avenue, with others in Grenfell Street, Rundle Street and Victoria Square (see a location map here). 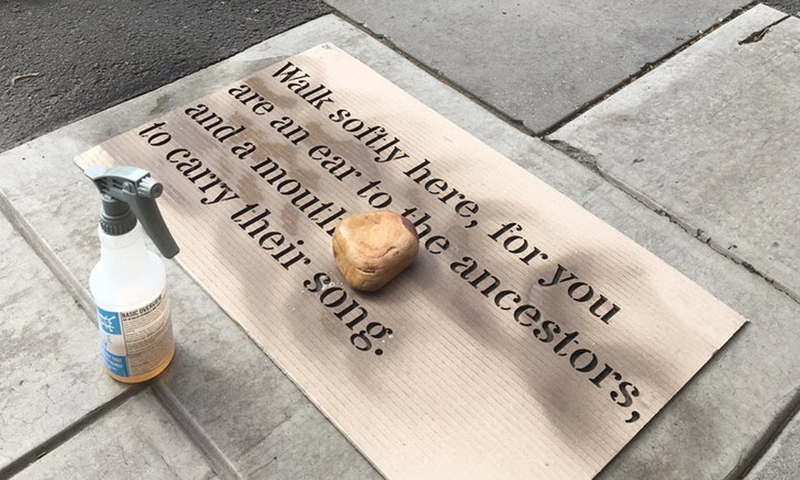 The project is being presented in collaboration with the JM Coetzee Centre for Creative Practice at the University of Adelaide and is supported by Fab Lab, which laser cut the stencils needed to transfer the poems onto the footpath. Unbind, by Gunai poet Kirli Saunders. König says most of the poems are around four lines or less, with themes including the weather, war, family life and indigenous sovereignty. The titles – such as “Dear Rainclouds”, “Loneliness”, “Stretchmarks”, “City Orthodontics” and “In Search of a Saviour” – give a hint at the range of ideas. “I wrote my poem specifically with the idea in mind that it was going to be put on the ground,” König says of his own verse. Now, Adelaideans will just have to wait for more rain so they can view the poems. The “invisible” paint is said to last around six weeks, depending on the weather and amount of foot traffic. A verse on North Terrace. All photos courtesy Raining Poetry.